Sorry, this item is out of stock. If you’re interested in one, contact us so we can gauge interest in continuing to offer them. 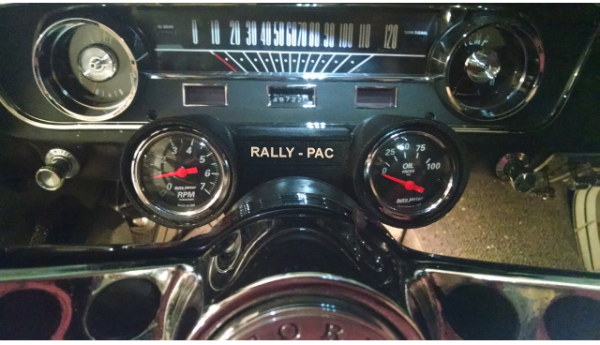 Add gauges to your 65 or 66 Mustang steering column for less with the Rally-Pac Style Gauge Pod. Also fits many Ford Trucks and Early Bronco! Give your car or truck the Rally-Pac performance style without spending hundreds of dollars on a factory original or reproduction! Adding gauges to your steering column is one of the easiest places to see them. Plus, they look great in this gauge pod instead of being mounted with hose clamps! Fits '65-'66 Ford Mustangs, and many Ford Trucks as well as Early Broncos ('66-'77), vehicles with 2 1/4' steering column. The Rally-Pac Style Gauge Pod is the most attractive way to upgrade your instrumentation for a fraction of the cost of a factory original or reproduction. Optionally add the Trac-Pac™ Sequential Shift Light technology to help dial in your car and driving - shift at the right time, every time! NOTE: all gauge pods are sold unpainted and do not come with gauges. Looks similar to vintage Rally-Pac gauge pods, but fits many vehicles. Put gauges where you can see them. No need to hold it in place with hose clamps! Works with 2 1/16" gauges with stud mounts. Paint it however you like. The Rally-Pac style gauge pod is much less expensive than reproductions available, even when filled with gauges. Integrate the Trac-Pac™ Sequential Shift Light technology and wireless data logger to optimize your car and driving. Don't wait any longer to put your gauges in a great-looking gauge pod on your steering column! Fast Lane Innovations partnered with a Mustang owner/enthusiast to create an attractive and functional design, and we mold these from a very durable and impact resistant blend of polycarbonate and ABS (ABS-PC). These are made by Fast Lane Innovations, LLC in the USA. Currently, these are sold unpainted (some pictures show what a black wrinkle finish would look like but all variations are unpainted), you can paint them with wrinkle finish or whatever color you like. NOTE: Flat rate or free shipping only available to continental US (lower 48 states). Please inquire for rates outside this area. The shift light option cannot be shipped outside the US at this time.